Prince Elian is a warrior, a pirate who feels more at home at sea than in the rich and prosperous kingdom he'll inherit one day. He can't stand being at home and only feels complete when he's on his ship. He is on a mission, he wants to stop the evil murders of his kind at sea and therefore kills sirens, he is trying to find a way to permanently stop them. Humans and sirens have been at war for many years and many of his fellow princes have found their early deaths because of the lure of a vicious siren. When he rescues a girl from the sea this complicates his plans, he isn't sure if he should give her a chance or lock her up. Elian might be a killer when he has to be, he also has a kind heart. Will this be his downfall? The Sea Queen is vicious and has turned her daughter into a cruel killer. Lira is a dangerous murderer and princes are the ones who fear her the most, because she takes out and collects their hearts. Lira is almost ready to become the next queen, but when she disobeys her mother's orders the Sea Queen punishes her daughter in a terrible way. She turns Lira into a human and orders her daughter to kill prince Elian without her siren magic to fall back on. Prince Elian is planning a quest and it suits Lira's needs to join him. Will she be able to fulfill her mother's wishes, so she can return home and resume her old life or will Elian sense the danger Lira's presence puts him in before it's too late? To Kill a Kingdom is an amazing magical story. Lira is dangerous and lethal, but she does have a conscience. She isn't as cold-hearted as her mother. However, she desperately want to please the Sea Queen and by becoming a ruthless killer she tries to avoid her mother's wrath as much as possible. The Sea Queen's punishments are harsh and severe, which is how Lira ends up on Elian's boat. Elian hunts her kind, so he's her archenemy. By being human she has the chance to get to know him and to find out more about the only person who can give her back her life as a siren. Elian lives for the water and his boat is his home. He's brave and daring and will do whatever it takes to complete his mission, making sure the sirens will stop killing his friends. I admired his courage and chivalry and was curious to see how that would influence Lira. Their connection fascinated me from the beginning and I couldn't turn the pages quickly enough to find out where their story would lead. Alexandra Christo has an enchanting writing style. Her gorgeous descriptions of land and sea are making her story come to life in a terrific way. I loved the way she writes about magic and her worldbuilding skills are marvelous. To Kill a Kingdom is a gripping adventure filled with surprising twists and turns. There are many fabulous creatures and the combat scenes are fantastic. I really enjoyed reading To Kill a Kingdom, it's entertaining, mesmerizing and romantic. If you love fairytales about handsome princes and sea creatures you will definitely like To Kill a Kingdom. 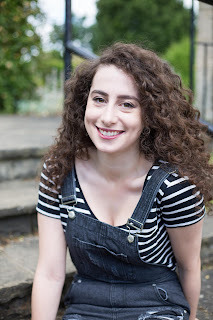 I’m a 20-something K-drama addict from (not-so-sunny) England who loves writing about characters with questionable morals. I studied Creative Writing at university and I definitely blame my professors for bringing out the dark side of my writing. I was a contemporary romance writer before I took their classes! 2) What’s the most fascinating thing about water creatures? I love the thought of there being an entire world that we can’t see, right beneath the surface. It’s fascinating to think about how vast and unknown the ocean is, and the kind of monsters that could be lurking underneath, with their own customs and traditions. Their own kingdoms, ready to take us on. 3) To Kill a Kingdom has a lot of action and adventure, how do you write those gripping scenes? Writing action can be really hard for me, because I’m most at home writing character interactions and dialogue. When I need to write a chapter with action, I actually watch a lot movies to help me figure out the semantics of what things should look like (movies definitely count as research in my world!). I’ll also read books which have great fight sequences or bloody battles I can draw inspiration from. For me, action scenes take the longest because I have to think about where every character is and how they’re moving and what the end result of each of those choices will be. And then I need to make it interesting – nobody wants to read a long list of actions. There needs to be emotion and intensity behind each blow to keep readers invested in the characters’ journey. 4) Can you describe the main characters of To Kill a Kingdom in seven words each? 5) What’s your favourite fantasy story? Daughter of Smoke and Bone by Laini Taylor is the story that made me fall in love with fantasy, so it’ll always hold a special place in my heart. After reading that, I knew I’d found the type of story I wanted to write. 6) You like writing about characters with questionable morals, what’s the allure for you? I think anti-heroes are more relatable. They make mistakes, they have flaws and things don’t always work out the way they want them to. That’s all of us. We can be selfish and get things wrong, but it doesn’t mean we’re bad people or that things won’t work out in the end. That’s what makes us root for anti-heroes: we want them to learn from their mistakes and grow, so they can make things right. It’s a lot more significant to follow a character whose journey starts out questionably, but who has the potential to make it right in the end. They also offer a lot more freedom; there’s less limits on what a character will or won’t do, which makes for a very gripping read! I’ve always been writing, ever since I was a child. It’s the only thing I ever wanted to do. I knew if I couldn’t write books, I’d always be writing something. Luckily for me, my dream came true and I was able to get published. It’s something that still feels so surreal and I can’t believe that it was more than two years ago I got my first deal. Time flies! 8) If you could be a character in your own story who would you be and why? I really like Yukiko. She’s not a murderer (sorry Lira & Elian! ), but she is fierce and fearless, and not afraid to go after what she wants. She opportunistic and a force to be reckoned with, whether she has a blade or not. Plus she has a huge family of bad-asses who will always have her back! 9) You love food, where does that passion come from and what’s your favorite kind? I’d definitely put it down to my Italian and Cypriot roots. My family are huge foodies, so I grew up surrounded by people who love cooking. Any get-together we have is food-filled and we all love trying new things and loading our plates to the very top. When I became vegan, that opened up a whole new arena of food and really encouraged me to have fun with cooking and hunt down awesome plant-based restaurants, which can be super experimental. I think my favourite food will always be gnocchi. My Nonna made the best. And tiramisu! Yuuuuum. I’m working on my next book right now which I am so excited to share. It’s fantasy, but with a very different vibe than TO KILL A KINGDOM. It’s a lot grittier, with some steampunk vibes, and features a whole team of morally questionable characters that I love writing! One very lucky reader of With Love for Books will receive a paperback copy of To Kill a Kingdom by Alexandra Christo. This sounds like a good read, thanks for the review and giveaway! 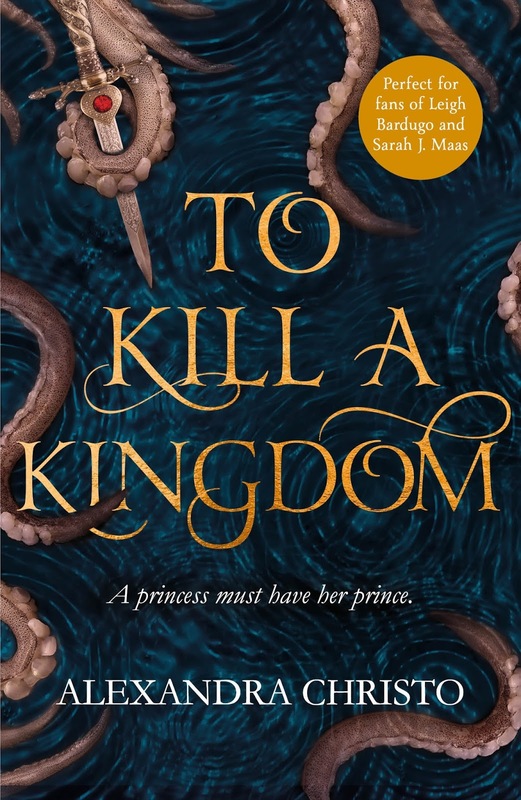 To Kill a Kingdom sounds like a dark, YA fantasy with stunning imagery, epic world-building, a superb plot and gives an unique perspective on The Little Mermaid. I've been hearing such great things about this book. I can't wait to read it. This sounds like a book I would really enjoy! Thanks for the chance! I am really looking forward to reading this! Thanks so much for the giveaway! I’ve heard many good things about this book and can’t wait to read it. This sounds like a classic story of a human and a magical being! I’ve heard great things about this book. Also, it’s awesoem to hear that Daughter of Smoke nd Bone is her fav! I've read two really good reviews of this recently. It sounds like something I would love! This sounds like a wonderful fairytale story, really looking forward to reading this. This sounds like such an incredible book, I can't wait to read it! seen this advertised and KNOW I'd love to read it!! This sounds like a really good fairytale type of read and I like what the author said about flawed characters, I totally agree. I read the goodreads reviews on this earlier in the month and immediately put it on my TBR list. I'm hoping to get to read it in the next month. This book is a must read for me with the setting and unique retelling plot. The Cover is so amazing!!! And sounds fantastic,looking forward to read! I love books about pirates and sirens, so count me in! I'm so desperate to read this! I like the descriptions of the characters. Makes me want to read more. I spent ages staring at the cover, it's gorgeous! Oooh this book sounds so good! Love love this book so much!! I so hope to win it! I have to read it, I neeed it, I crave it. It's always good to see new young authors coming through. What a startling mix of sacrifice, pirates, sea queens and romance this sounds. I can't wait to see how the 2 worlds entwine and what happens. Sounds a fantastic story and will appeal to a lot of readers as it combines a lot of different genres. Thanks for the great book prize and for running the competition. Of course we love the anti-heroes, the underdogs. They are us and we want to succeed!